EARLIEST ECHINOID LYING ON TOP OF A CRINOID - CARBONIFEROUS TEXAS. EARLIEST ECHINOID LYING ON TOP OF A CRINOID - CARBONIFEROUS, TEXAS. A complete but flattened very earliest example of an Echinoid. Shows a mass of 3D spines with scattered plates from the test in amongst them. 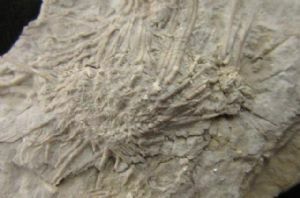 At one end there is the stem of a Crinoid the head and arms of which can be seen on the opposite side of the Echinoid which must have come to rest on top of the Crinoid. Really nice detail. Unusual. Carboniferous, Late Pennsylvanian, Winchell Formation. Matrix : 9.5 x 7 x 1.3 cm. Echinoid : 6 cm. across .